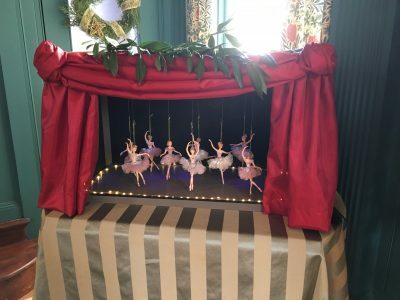 This weekend we enjoyed a wonderful extravaganza at the Crosby Mansion in Brewster that included a holiday tour with the Nauset Garden club creating an absolute work of art with their flower and room displays. I especially appreciated the tidbits of history that was shared by each member as we moved from room to room. 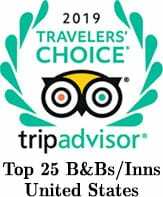 I attended this event with my mom many years ago and each time I go it seems only to get better. 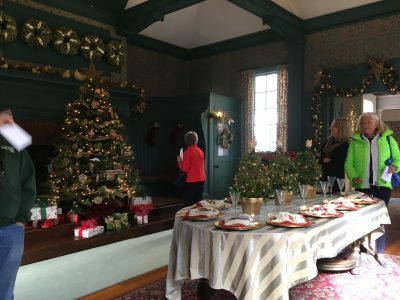 The Garden Club organizes this event every three years, and I am determined next time around to give our readers and guests a little notice, so that they can reserve their stay and plan a visit to the Crosby Mansion ‘Tis the Season” extravaganza too. In the meantime, here is a little glimpse of the mansion along with some interesting history. 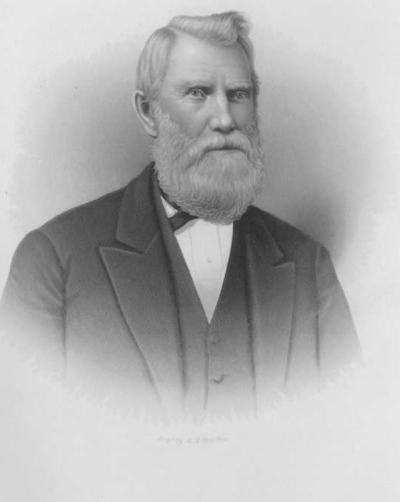 Albert Crosby was born in Chatham on January 14, 1823. 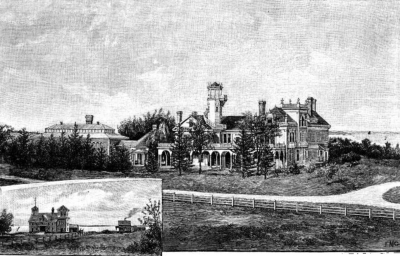 In 1832 when Albert was 9, his father moved the family to Brewster where he built the modest family home that was later enclosed in the Crosby mansion. 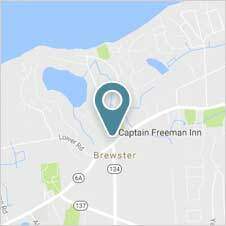 It’s interesting for me to compare the history of Albert with that of Captain William Freeman, who was born in 1820, built the home that we live in and run as the Captain Freeman Inn, and to think that their lives in Brewster probably crossed paths frequently. I had to chuckle when learning that Albert first tried to make a living by joining the Mercantile Marine service whose business was trading goods between Boston and the West Indies ( a route that Captain Freeman followed many times). He quickly decided that he would rather make his fortune on land. 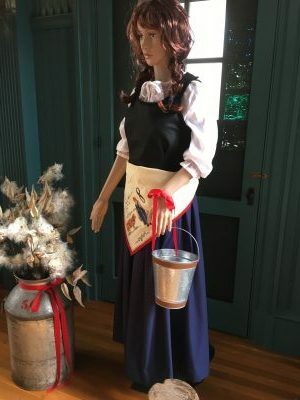 A year after Albert married Margaret Henderson in 1845, the couple moved to Chicago where he amassed his fortune operating the largest distillery of medicinal alcohol. When the Civil War broke out the government placed a tax on all alcohol to raise money for the war and since Albert’s business sold to the Union Army and druggists, his alcohol was not taxed, and he amassed quite a fortune. While in Chicago, Albert took over the Chicago Opera house. He totally refurbished the building and just before the reopening, the Fire of 1871 totally destroyed that building and an adjacent art gallery. Because of the fire, Albert lost over 1.5 million dollars. That was also the year that Albert and Margaret agreed to divorce. Soon after, he married Matilda Sourbeck, who was much younger. After their marriage, Albert brought Matilda to the family home in Brewster where he had so many fond memories. This undoubtedly was not the home that Matilda envisioned for their entertaining. This was when it was decided that an “addition” was needed to the family homestead:) and when the idea of “Tawasentha” was formed. The Crosby mansion was built from 1887 to 1888 by John Hinckley and Sons as a summer house for Albert and Matilda. 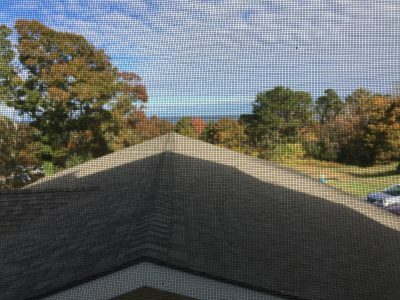 Standing tall with breathtaking views of Cape Cod bay, the three-story mansion is also a monument to romance. It is the legacy of a man who went west to make his fortune and returned to the cape with a bride 20 years his junior, for whom he built the mansion called Tawasentha. Albert spared no expense for the three story, 35 room home overlooking the Bay. Completed in 1888, the home was named “Tawasentha”, probably after Longfellow’s poem, “Song of Hiawatha”. It was built in the grand style of Chicago’s Gold Coast Mansions and featured a 65 foot viewing tower that served for water and viewing (this tower was destroyed during the hurricane of 1938) , 13 fireplaces with imported tile, hand carved mahogany and oak walls, a parlor fashioned after one at the Palace of Versailles, an entrance duplicating one at Buckingham Palace, a two-story billiard room, marble sinks and floors in the baths, and during Crosby’s time had gas lighting and heating throughout. 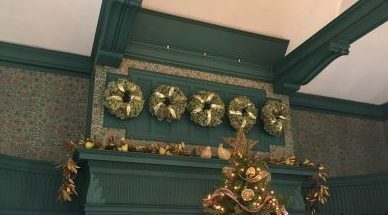 (much to the chagrin of the garden club ladies- the present building does not have heat:( Because of its heightened construction, the Old Colony Railroad, which is now the wonderful Cape Cod Rail Trail, laid a side track to the site. The mansion was designed for the lavish entertaining his young wife, Matilda, loved. 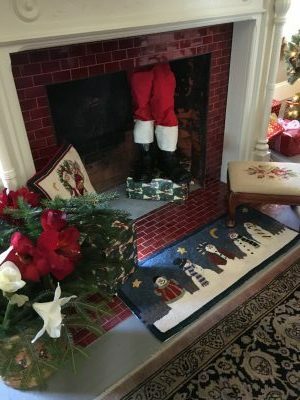 Legend has it that when her entertaining was too much for the older Albert, he would slip away to the old homestead and sit peacefully in his favorite rocking chair. 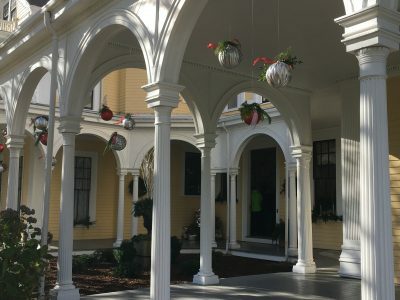 Back to the current gala where sixteen of the 35 rooms were festively adorned with wreaths, swags, trees, flowers, ornaments, packages and other creative surprises. 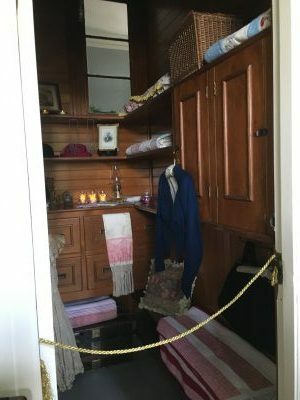 This tiny door was sandwiched between two rooms and two fireplaces. It led to a tiny room that was always warm and so it became the room to dry clothes and food. 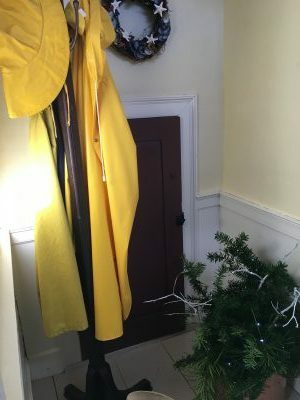 This door was just off of the back door of the original house and was used to store coffins when a family member passed away and was awaiting calling hours in the home. 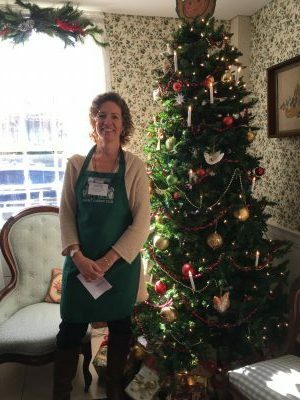 Deborah Kimball, a dedicated Garden Club member, is shown here next to the tree that she helped decorate with hand strung cranberries. 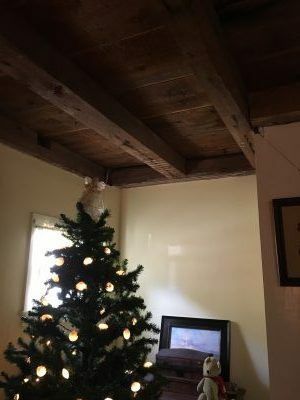 One can just imagine Albert sitting in this room as a young child stringing cranberries for the families tree. 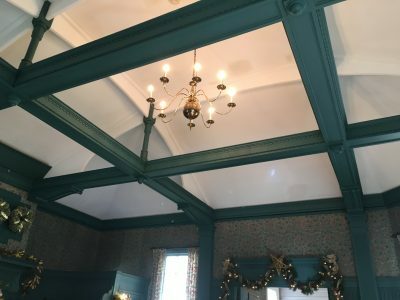 One can see the original ceiling in this part of the house which are quite different from the ones in the main part of the mansion. Shown here is the Billards room which was built to resemble an Adirondack Hunting Lodge, which was very popular among the barons of that time. 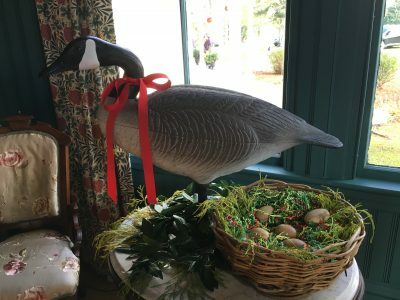 The Billards room was my favorite holiday display which included a wonderful interpretation of the Twelve Days of Christmas. It was so much fun looking around the room and finding all of the creative displays that represented the twelve days of Christmas. 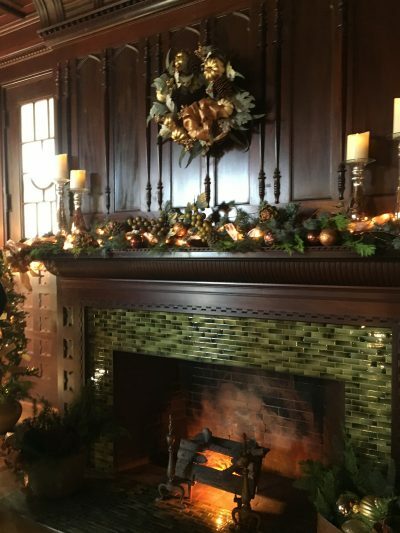 This picture is of the hearth in the Library room (also called the Mahogany room) which is adorned with the original wall coverings called anaglypta. It is very fragile and composed of hard and soft paper in layers, pressed to give a decorative relief. 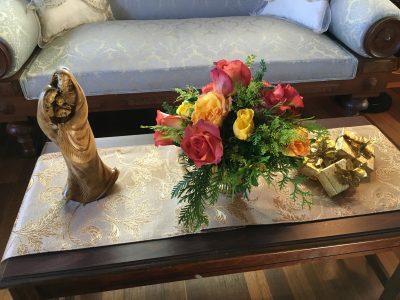 It was originally finished in gold leaf. 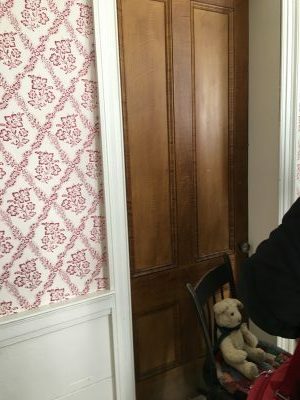 The wall paper caught my husband’s eye and hard to believe that is has lasted since the home was built in the 1800’s. 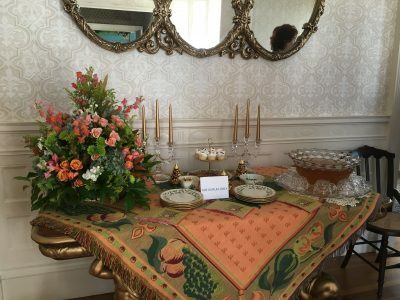 The flowers throughout the mansion were breathtaking…. 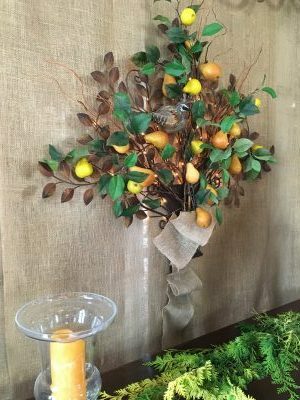 The tables were all perfectly set to entertain……. and the punch ready to enjoy…. and ohhhh the closets, even they were decorated for the gala…. 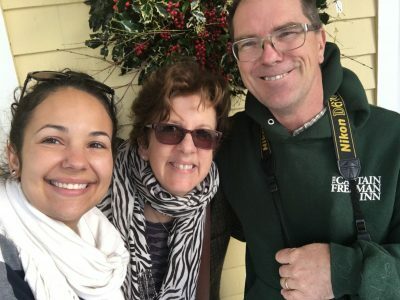 We really enjoyed our tour of the Crosby mansion and enjoyed sharing the morning with our Brewster by the Sea innkeeper, Elizabeth. 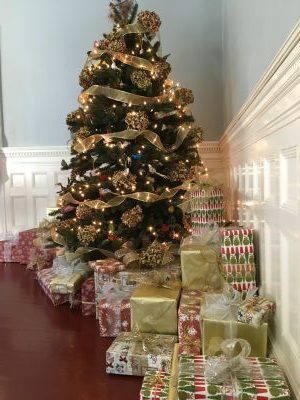 The Crosby Mansion was acquired by the state in 1985 and in 1992 through the hard work and dedication of the Friends of the Crosby Mansion the museum is being restored and preserved for all to enjoy. 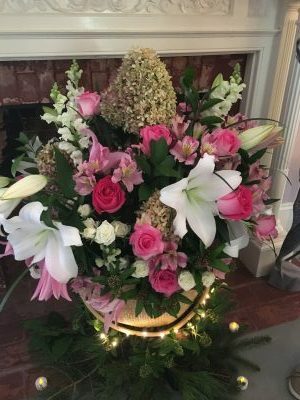 Thank you Friends of the Crosby Mansion and the ladies from the Nauset Garden Club. You created a very memorable event that will be in my mind for many months to come.